Beautiful certificate from the F.H. 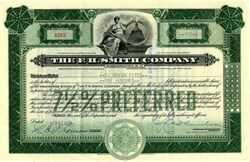 Smith Company issued in 1929. This historic document was printed by Security Banknote Company and has an ornate border around it with a vignette of an allegorical woman next to the capitol building. This item has the signatures of the Company's officers and is over 83 years old. The certificate was issued to G. Bryan Pitts, who was the Chairman of the Board. The F.H. 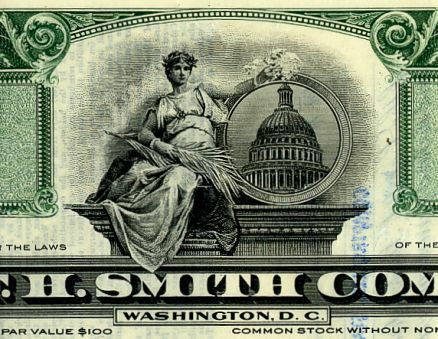 Smith Company was a Real Estate and Banking concern which sold bonds Their Chairman was G. Bryan Pitts. On January 11, 1930, the F.H. Smith Company and seven directors were under mail fraud indictments in Washington and under investigation for other crimes. Subsequently, G. Bryan Pitts received a fourteen-year penitentiary sentence for commiting fraud.